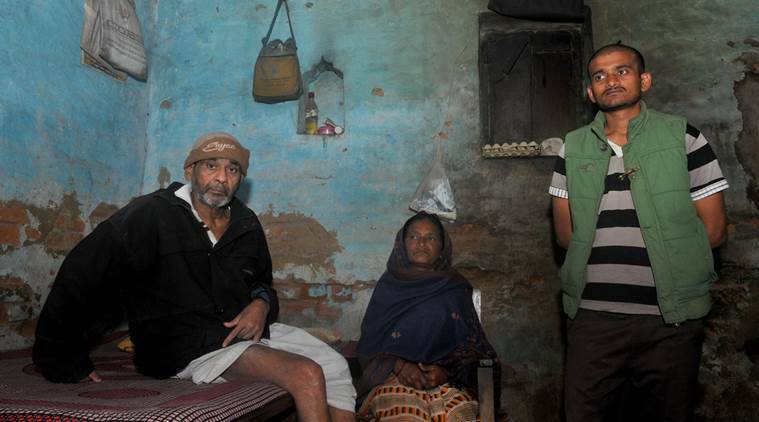 For poor people like us, education is biggest capital: Kanhaiya’s father. In an old brick house in Bihat village in Bihar’s Begusarai district, the home of arrested JNU students’ union president Kanhaiya Kumar, his parents are stunned by the sedition charge slapped on him. They say he can never be “a danger to Mother India” as he is being called. Kanhaiya’s mother Meena Devi puts on a brave face. “This phase will pass… Nothing shall happen to my son because he can never say or do anything against the country… There is a court. I have full faith in my son and God.” An anganwadi worker, she supports the family with her earnings of Rs 3,000 a month — the eldest of three sons too works. Struggling to raise himself on the bed to catch TV updates on his son, Singh believes his son has been “framed because JNU is a Left stronghold”. He thinks Kanhaiya landed in trouble because “he had campaigned for the CPI candidate” during the Bihar polls last year. Bihat is part of the Teghra assembly constituency, now held by the JD(U) but known as the “Leningrad of Bihar” because it was the Left citadel for four decades, witness to many a vicious battle with non-Left parties. From the R K C High School in Barauni, Kanhaiya graduated from Magadh University. Kanhaiya’s father is a Class X-dropout who used to work in supply of stones. Meena Devi is a matriculate. Their eldest son, Manikant, works as a supervisor with a company in Assam. The Begusarai units of the All India Students Federation and All India Youth Federation protested against Union Ministers Rajnath Singh and Smriti Irani Saturday.